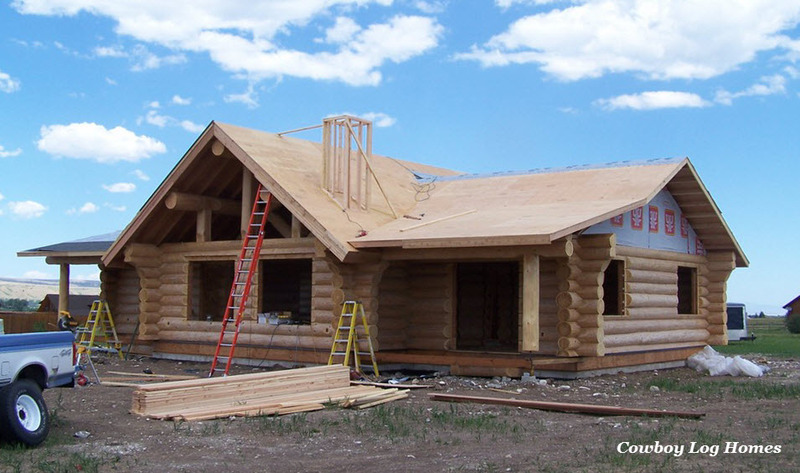 Now we are up to day six of our log home build. Over the course of this day the main focus is on the roofing. At this point it is critical to get the roof sheathing covered with the titanium (tar paper like product) and the architectural shingles. 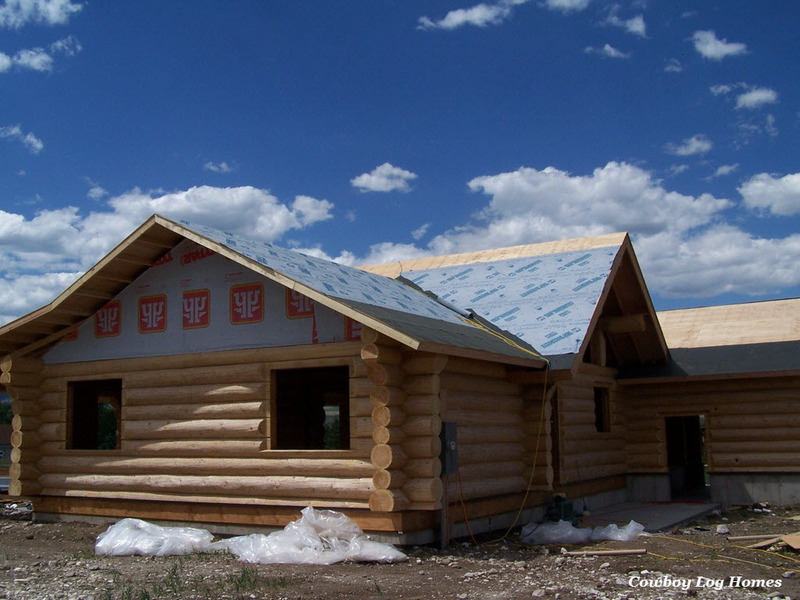 Installing the exterior doors and windows is also important, but the roofing must come first. Beginning on the morning of the six day, the chimney is framed in. Later it will be covered with plywood, lathe, and cultured river rock stone. But for now we begin with the framing. 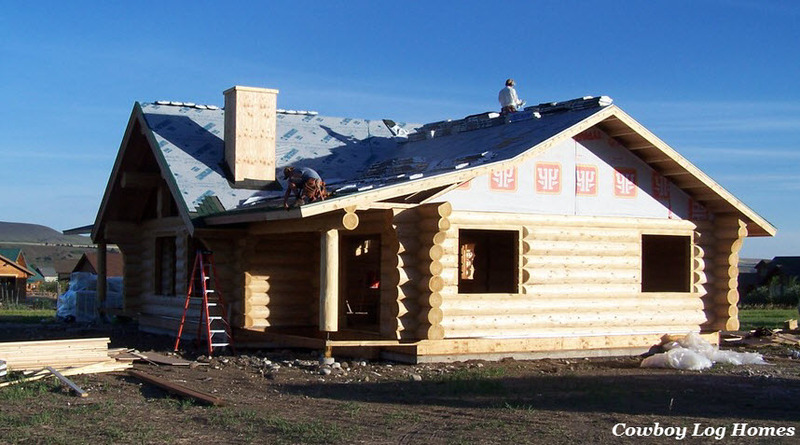 The edge of the titanium is also visible on the peak of the right hand wing of the log home. Moving on to the left hand side of the home we can see the titanium has been applied to the valley between the great room and the master bedroom wing. The titanium is installed from the bottom to the top of the roof slope. This photo shows that the garage is also being worked on. Now for the rear of the home. The titanium that we saw peaking over the roof is also on the back side of the bedroom wing and the great room. Only a small portion of the peak is still exposed. As the evening of day six ends, we have a conveyor belt truck deliver the shingles and run them directly up onto the roof. Now the shingles are in place to begin for the next day. 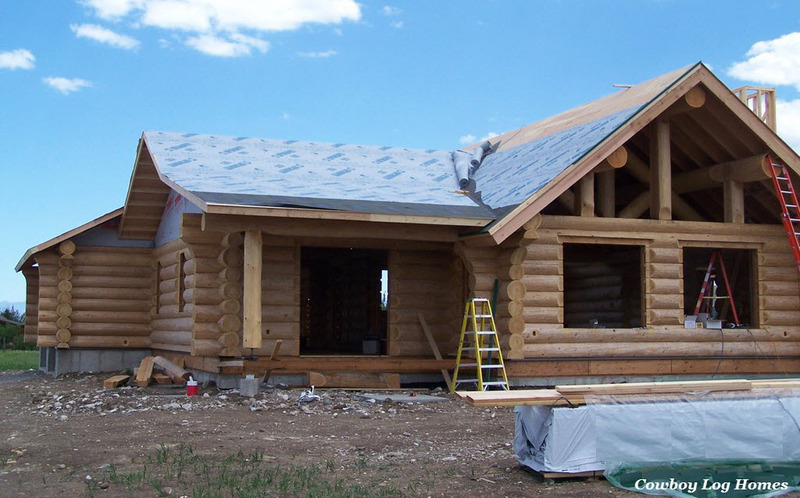 One of the log home building crew is working on the porch roof and beginning to lay the first layer of shingles. As I mentioned above, titanium is similar to traditional tar paper, but it is stronger and more expensive. Our roofing crew felt they could move faster with this product than working with rolls of tar paper. Obviously they are moving along at a quick pace, so we wanted to do everything possible to continue the momentum.